Yesterday I had a BBQ with some friends. The sun had already set and the only light source left (besides some ambient light from the world around) was a low energy light bulb. After a while I started to see lighting changes in the faces of my friends and the number plates of their cars. It felt like someone toggled the light very fast. When looking at the wall or the light directly I didn't notice any flickering. In my country the power grid is running at 50 Hz. Is it possible that I actually saw the flickering caused by the alterations in the power grid or am I just going insane? Yes, the flickering of a light bulb may be noticeable, and yes, that's directly related to the mains frequency. However, since the flickering of a bulb is about two times higher than the temporal limits of our visual system, it is unlikely to be perceivable. The temporal resolution of the visual system can be quantified in a number of ways. As you are referring to a relatively simple flickering stimulus, the critical flicker fusion frequency is probably the most relevant. At a certain critical frequency, a flickering stimulus will appear as a continuous stimulus. This critical flicker fusion frequency limit is around 50 Hz, but variable between 5 - 50 Hz, dependent on the lighting conditions (Kalloniatis & Luu), see Fig. 1 below. For example, the turn signal of a car is obviously flickering (flickering in the 1 Hz region). But an object displayed on a standard flat-screen computer seems steady. A monitor's refresh rate is typically 60 Hz, which is indeed above the critical flicker fusion frequency (Holcomb, 2009). However, the good old CRT screens can sometimes seem to be flickering. The mains, as you indicate, is indeed 50 Hz (Europe, Australia) or 60 Hz (US), and indeed the flickering is at this frequency. Similarly, well functioning fluorescent tubes seem to flicker on occasion (when they are reaching their end they start to flicker too, but that's because of a failure of the device rather than the mains frequency peaking through). Due to a similar effect, light bulbs may seem to flicker too. However, because of the sine wave characteristic of the mains alternative current, featuring two peaks per wavelength (a negative and positive peak, the flickering of a light bulb is actually two times the mains frequency, or 100 - 120 Hz. This is quite far above the critical flicker fusion limit and hence will likely not be noticeable. It's interesting to see that you mention that it was around sunset. Scotopic vision (night vision) is mediated mainly by the rod photoreceptors. The rod visual system mediates gray scale vision at low-lighting. While spatial resolution is poor, it's very well adapted to process fast-moving stimuli. 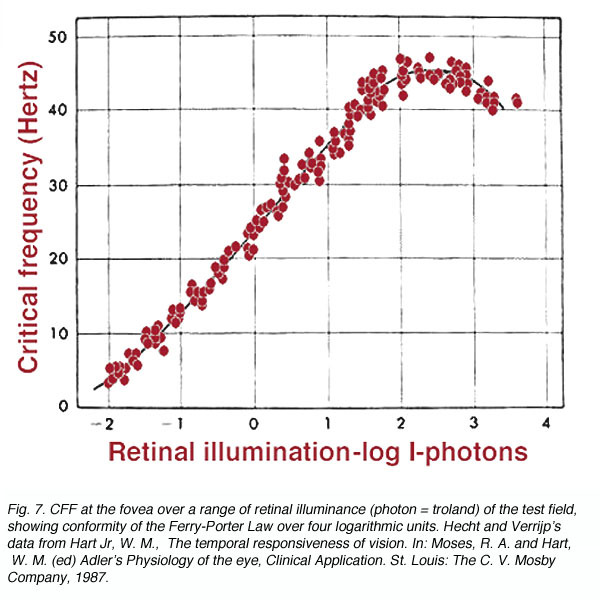 Hence, the flicker fusion frequency under scotopic viewing conditions may indeed be higher; i.e., flickering of light bulbs may not be perceived during the day (Federov & Mkrticheva, 1938). Nice add-on there. To add to this as alluded to in the comments, whether the flicker of mains-grid powered appliances are actually visible depends on a lot of factors other than flicker frequency. CRT screens, for instance, may have improved phosphors that have delayed response times, 'smearing' out the flickering into invisibility. In other words, it's not a simple matter of 'ON' and 'OFF'. Likewise, light bulbs heat up and hence the temperature difference might not be noticeable to us, as the temporal flickering depends on heating and cooling of the wire. A lamp flickers at 2x the mains frequency, i.e. 100 or 120 Hz, and that is typically not noticeable to human eyes. It is visible to chicken and insects. That being said, a low quality lamp or a lamp at end-of-life may also flicker at 50 or 60 Hz, and you will notice. It depends on the brightness, so an area illuminated by the lamp may not seem to flicker. A simple way to suppress the flicker of a 60 Hz CRT is to put on sunglasses. The chemistry in your eyes is slower at low brightness, this makes the flicker less visible. The invention of 100 Hz CRT TV (I was involved) was necessary for allowing higher brightness. Let's say there is a point source of light (it could be a lamp or a highly reflective object) that undergoes large, rapid intensity changes, say 50-100 times a second. Let's say it takes 0.15 seconds to "flick" your eyes from right to left. This means a light flickering at 100Hz would be broken up into 30 "off" sections and 30 "on" sections during this time. So in fact you would be able to detect frequencies much higher than 100Hz. (This could make an interesting Arduino experiment.) I have noticed the effect when my laptop varies the brightness of its charging light using PWM. As it "darkens", the dashes in the dashed line get shorter, and vice versa. The objects are not "point sources"
This means that whenever you move your eyes around, a quick succession of bright "ghost" objects will additively combine in your field of vision. The effect will probably look like a sped-up version of strobe lighting. The same will happen with moving objects (e.g. someone waving a hand). But if you fix your gaze on a stationary object you will probably not see flickering. Not the answer you're looking for? Browse other questions tagged neuroscience vision sensation perception psychophysics or ask your own question. Can people with paralyzed eye muscles see?